Welcome to your most excellent journey to getting out of debt. If you follow the steps I’m about to lay out for you, I can promise that in the worst case, your situation will be vastly improved and in many cases, you will find yourself debt-free in much shorter time than you now think possible. In this step, I’m going to give you tools you need to determine exactly what the problem that is creating (has created) your debt problem. Hint – you may be surprised by what you learn. If you feel like you never have enough money to quite get through the month, this step will help you change all that and much more. Get rid of lingering debt. Even if you have a positive cash flow it still might be difficult to get rid of your existing debt. This step will give you what you need to solve that problem much faster than you think possible. Stay out of debt – for good. It’s great to turn your cash flow around and get out of debt, but the trick is not to fall back into debt ever again. This step will show you a few easy hacks to implement to do just that. Use your credit score to reduce costs. Once you’ve cleaned up your finances it’s time to turn your attention to your credit score. Many people who have struggled with debt in the past suffer the consequences long after they have cleaned up the problems because their credit score is in the basement. This final step tells you how to clean up your credit report and boost your credit score to take advantage of the lowest possible credit costs going forward. I do have one piece of advice before we get started; complete one step before advancing to the next and approach this process methodically. Don’t skip around or ignore any of the steps. Do them in the order presented – they are there for a reason and by design. 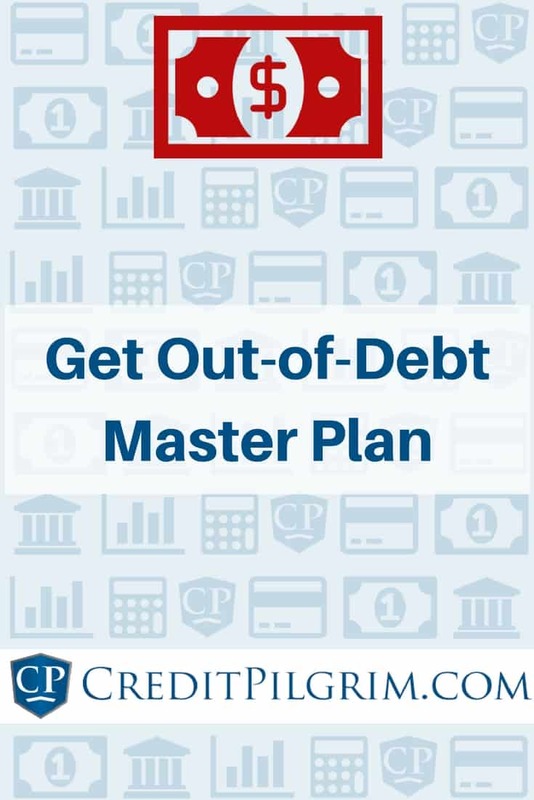 Getting out of debt and turning your financial situation around is much easier to do if you break it down into a step-by-step process and that’s what this white paper has done for you. But I do need to make one thing clear; even though this is really not that hard it does require effort. Yes, certain steps are easy to take but others require more dedication. That’s why the steps below break this down into simple, manageable, understandable tasks. Nothing here is beyond your understanding or capacity. You may or may not have to bring in some outside resources (and we’ll get to that if need be) but you can achieve your debt-free dream. If you are willing to do this, I know you will get a lot out of this process. I’m excited for you – and I’m waiting to hear how things go. Let’s hit it. In order to fundamentally fix your debt problem once and for all, we have to be systemic in our approach. OK? That means we need to analyze and understand exactly what the problem is. You may think you know what the issue is and maybe you do. But let’s go the extra mile. You may discover some new areas that need your attention. Do you currently spend more than you have coming in? Do you have debt you find impossible to pay off? Do you have both a negative cash flow and old debt you don’t pay off? If you answer “no” to all three questions above, congratulations! The reality is, you don’t need to study the rest of this paper. Go watch a few episodes of “Law and Order” – you deserve it! Then, go to Step 4 and 5 below. If you answered “yes” to any of the questions above, it’s worthwhile to go through the rest of this self-assessment process. We’ll start by taking a closer look at where you stand right now. Compare your average income to your average expenses and if the result is a negative number, you have a negative cash flow. Now, at first, this may sound easy but it’s actually a little tricky because for some of us, income fluctuates. And expenses fluctuate for everybody. So in order to determine if you have a positive or negative average cash flow, first calculate your average monthly income. The easiest way to do that is to add up all the income you earned and received over the last 24 months and divide the figure by 24. (Hint – don’t include cash you received for the sale of assets as that’s not repeatable income). In this case, Joe brings home $4500 a month (after taxes) from his main job and he has a side gig mowing the lawn for neighbors once in awhile. I’m showing you his total take home income for the last 6 months in this example. As you can see, his total income over that period was $28,200. Now, let’s determine what his average monthly income is. To calculate that, simple take the total take home pay and divide it by the number of months. In this case, we have a total income of $28,200 and we divide it by 6 months. The result is $4700. That means, on average, Joe brings home $4700 a month. Now we’re ready to calculate average spending. We’re going to use a similar technique as the one described above. Here is a detailed explanation on how to calculate your average monthly spending. Please go through the exercise. For most people, going through the exercise above will tell you if you are running a positive or negative cash flow. But if you are adding to your debt, spending down savings or earning or spending cash, your situation gets complicated. That’s why we’ve got to look a little closer. Go through your monthly activities. If your credit card or personal debt has grown, that means you’ve spent more than the exercise above shows. If you’ve taken money out of your savings/investments that also means you’ve spent more than the exercise above indicates. In either case, you have to add that to your monthly spending. On the other hand, if you’ve added money to your savings/investments and/or paid down debt, that reduces your spending figure for the month and you need to adjust your numbers accordingly. If you are having trouble figuring all this out, relax. I’ll walk you through the process. Look at your most recent credit card statements. They should summarize whether or not you’ve paid down some of the principal or have added to it. If the statement doesn’t tell you, simply call the lender and get the information. Your investment statements will tell you if you have, on balance, added or withdrawn from the accounts. If you only look at Joe’s bank statements (as described above) you would determine that he spends about $5000 a month on average. 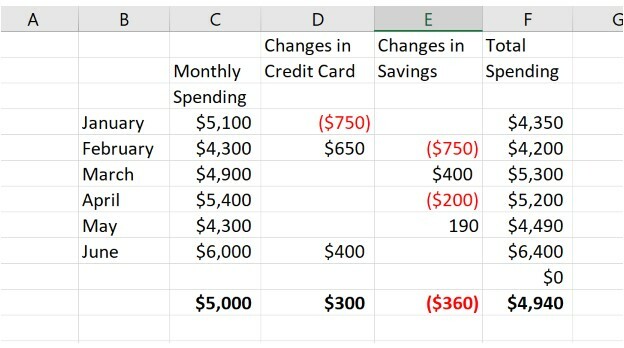 In January, for example, he paid of $750 on his credit card so that reduces his spending for the month down to $4350 (column F). Likewise, Joe also added and withdrew from his savings during the year. In March for example, he added $400 to his savings (and withdrew $200 in April). When Joe added to savings, he reduced his spending. When he withdrew money from his savings, his spending went up. When you add in the additions to credit and savings, Joe’s actual average spending is closer to $4940 a month. That isn’t a big difference for Joe but depending on your circumstances, going through this entire exercise would change your actual spending number. That’s why it’s so important to do this the right way. Once you calculate your average income and your average spending, it’s easy to figure out if you have a positive or negative cash flow. Take the average income and subtract the average spending. In the example above, we already know that Joe’s average income is $4700 a month. If he spends $4940 on average, he has a $240 negative cash flow, on average. If he spends $4000 on average, he has a $700 monthly positive cash flow. Calculating your average income and expenses is absolutely essential for solving your debt problems. Even if you have a positive cash flow, knowing your numbers is going to help you tremendously. Before taking another step, please work your numbers. Don’t worry, I’ll be here when you get done. Think of all you know about your situation right now. By taking these steps, you know if you run a positive or negative cash flow. You know your average income, average expenses and whether or not you’ve added to your overall debt or withdrawn from savings. To be honest, if you simply look at what’s happened to your debt (increased or decreased) and savings/investments (increased or decreased) it will tell you if you are running a positive cash flow. But I like to look at average spending and average income as well. This helps you drill down to determine where the problem might be. But let me give you a hint right now, if your average income exceeds average spending, either your debt should go down or your savings/investments should go up. If your debt goes up and/or your savings declines, it means your average spending exceeds your average income. If your numbers don’t support each other, it means either you spent a lot on a house, a car, some other major project or it means you are not doing your calculations correctly. If you add to your debt or withdraw from savings or investments over the year (on average) it probably means you are running a negative cash flow friend. Go back and figure out what the problem is before going on. Whether or not you have a positive or negative cash flow, we need to assemble information on your outstanding debts. We’re going to use this schedule later to build your plan to be debt free so please don’t skip this step. Take a few minutes to create your debt schedule now. If you currently have a negative cash flow, your situation requires immediate and massive action. Your boat is sinking Pilgrim. We’ve got to plug those holes before we go down with the ship. We are going to solve that problem in step 2. Please do that before doing anything else. If you have a positive cash flow (or breakeven) but have old debt, that situation is much less dire but still requires your attention and energy. We need to get you to the next level by getting rid of that debt once and for all. We’ll cover that in step 3. There are two effective ways to reverse your cash flow problem; earn more and/or spend less. Duh. You already knew that. But which of these two do you focus on first? It is very important to answer that question because you want to spend your time and energy where it counts most. The thing is, there is no formula I can give you which tells you which side of the equation you need to focus on first but there are a few good rules of thumb that should help quite a bit. Go through everything you spent money on for the last several months – and I mean everything. How much of it was required spending (rent, food, utilities, gas, etc) and how much was discretionary (eating out, travel, vacation, jewelry, gifts etc). Go through your entire spending for the last 2 or 3 months until you see a pattern. Let’s say that I spend $1,000 a month more than I have coming in on average (calculated in Step 1 above). And let’s say that after I review the spending details, I discover that I spend $1200 a month on average on junk I really don’t need to spend money on. That being the case, I think my solution is right there staring me in the face. I need to cut out that needless spending. Agreed? On the other hand, lets say I have that same $1,000 a month negative cash flow but I run a tight ship and I only spend $50 on eating out, recreation etc. If that’s my situation, my spending isn’t the problem and I should focus on earning more. Even if you have a full-time gig right now, there are a number of ways to earn serious side income without investing money or acquiring new skills. And if you’re looking to build an actual side business, you can do that too pretty easily. Of course, if I can’t find a way to earn more, I can consider long-term spending cuts like moving to a lower-cost residence. But this alternative should only be pursued once you’ve done all you can to bring home more money. Now, if a big part of your spending includes payments on high interest credit cards like many Americans deal with, I’ve got good news. We’re going to solve that problem in step 3 and that should help increase your cash flow as well as get you out of debt faster. Nice. You may be tempted to move on the next step; how to get rid of old debt but please restrain from doing so until you hammer out a plan to turn your negative flow around. If you still have a negative cash flow, you won’t do yourself any favors by ignoring the problem before you advance to Step 3. That’s because if you spend more than you bring in, what you are doing is creating more debt. No Bueno. Once you’ve taken care of your cash flow challenges, it’s time to focus on getting out of debt (especially credit card debt) once and for all. This is all important and here’s why. You will never meet anyone who is successful financially who also has high cost debt. In fact, I’ll go out on a limb and tell you that I’ve never even met anyone who was happy who had this kind of monkey on their shoulders. There may be such a person but I’ve never met them. Here’s why. When you carry high-cost consumer debt, it prevents you from investing for your future so you have nothing to look forward to – other than continuing to slave away for the credit card companies. When you are in debt like that, you can never really spend money and enjoy it. You’ll always feel guilty about spending on yourself knowing every dollar you spend you could use to pay down that debt. That’s the bad news. But the good news is there is a well-defined process for getting out of debt. Many people get complacent when it comes to high interest rates that creditors charge. In fact, the entire credit card industry is counting on this. Take advantage of low-cost (or zero cost) offers from other credit card companies. Many credit cards will refinance your high cost credit card debt with zero percent balance transfers for a year or 18 months. Take advantage of that to drive down your cost of current debt. Get your family and friends to refinance your high cost debt by offering them higher interest than they can get in the bank – but much lower than what you currently pay. Turn to a peer-to-peer lenders like this one or this one. Many times, you can cut your interest costs in a third or even one half by simply registering with one of these firms. Dave Ramsey wrote about the “debt snowball” and it helped a lot of people. Using my tweak on his system, you pay your highest cost debt first and make minimum payments on all your other cards. In the example above, you can see that the minimum payments on all the debt is $3049 per month and the current payment is $4100. I want you to make the minimum payments on all the debt OTHER than the highest cost debt which in this case is to Jumbo Retailer because they are charging 18%. It doesn’t matter what the balance is. It matters what the cost is.And I want you to get rid of the highest cost debt ASAP. Once you’ve paid jumbo Retailer off, you still use that $4100 but make minimum payments to everyone OTHER than ABC retail because they have the next highest debt. You see what we’re doing here? You are throwing all available resources at the biggest problem and once that is taken care of, you apply those same resources to the next biggest problem. By doing this, you have more and more resources to use to retire a shrinking debt. This system will accelerate your debt freedom date and I encourage you to put it to use. After you turn your cash flow around and get out of debt, you’re going to feel pretty darn good. Just imagine that and use that feeling to motivate you to take the steps I detailed above. The next thing for you to do is put in place a system that will help make sure you never get into this problem again. Continue to track your average spending and compare that number to your average income. If those numbers start to move sideways, you know what to do. No matter who you are, unexpected stuff happens and you have to be prepared. If you don’t put something aside for emergencies, you could find yourself right back in the same mess you started with. Here’s a resource that can help you determine how much you need to set aside for emergencies and how to fund that emergency account. Automate bill pay and investing. My strong recommendation is to take advantage of bill pay (offered by most banks) and automatic investment plans (offered by most brokerage firms). People who do, never have to worry about paying bills late or not saving. Once you put these two aspects of your financial life on autopilot, there are two things you can cross off your “worry about” list. No matter how clean your current financial situation is, your credit score may require your attention. Even if you are current on all your bills, your credit score could contain errors or other bad information and that’s expensive. Dings on your credit score result in lenders charging you higher rates for loans and can even prevent you from finding jobs. You can improve your own credit score or have someone do it for you. But regardless of which way you go, it’s important to understand the process. Here’s a great resource that will help you understand how to fix problems in your credit report and maximize your credit score. It can be overwhelming if you are in debt. Just the scope of the problem can freeze you out of action but it doesn’t have to be that way. First, give yourself a thorough self-assessment to understand the extent and scope of the problem. If you run a negative cash flow, attack that problem first. Next, turn your energy towards getting out of debt. Having taken these steps, put in place a few safeguards to make sure you never fall into the debt trap again. And when all that is done, go the extra mile to fix your credit score. This may seem like a lot. But if you break the steps down and focus on one thing at a time, you can experience a debt transformation you never dreamed possible. Are you willing to get on the road of financial freedom from debt? What’s stopping you?